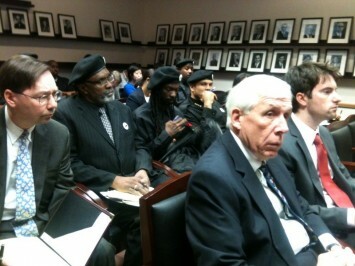 On April 23, 2010 the U.S. Civil Rights Commission Dismissed the Charges Of Voter Intimidation Case Against Members Of New Black Panther Party. 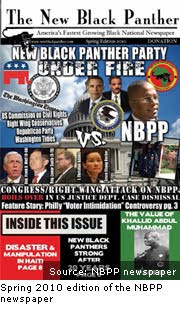 These charges stemmed from an event on election day in November 4, 2008, as stated in charges drawn by The U.S. Justice Department, which filed a lawsuit under the Voting Rights Act against the New Black Panther Party for Self-Defense (NBPPSD) and three of its members alleging the defendants intimidated Philadelphia voters during the Nov. 4 general election. The complaint said that NBPPSD Chairman Malik Zulu Shabazz confirmed that the placement of Messrs. Shabazz and Jackson was part of a nationwide effort to deploy NBPPSD members at polling locations on Election Day. But this conflicts with a contemporaneous statement the NBPPSD posted on its Web site that the actions of the two individuals were not endorsed by the organization. posted on the Web at: http://www.electionjournal.org/. undermining the federal oversight of the Justice Department." ..."Eric Holder has stonewalled Congress, the Civil Rights Commission, and the American people regarding the inexplicable order that political appointees at Justice gave last year to drop the slam dunk winning case against the New Black Panther party. Members of the group were caught on tape clearly intimidating white voters at a Philadelphia polling place. A summary judgment followed but before sentencing, Justice dropped the case. When some Republican senators asked why, Holder refused to comply with requests for an explanation. Even a US Civil Rights Commission subpoena couldn't get Holder to supply them with a reason why he dropped a case that Justice had already won. prove very interesting to Congress..."
and this,..."I expect executive privilege will play a role somewhere down the road. This can of worms is so toxic I doubt whether Obama wants it spilled all over the national media. The political interference in this case is so dramatic and so obvious that exposing it would probably mean curtains for Holder." that affronts your over sized ego. Almighty God is angry with America. God is angry with America due to her continued mistreatment of her former slave. If these cantankerous, politically constipated right wingers refuse to change course, as their nature is rebellion, then God’s judgment will come down on them and never will they see power in America again. Hands off the New Black Panther Party! Hands Off the Black Peoples of North America and Africans worldwide!" And of course they blamed the Bush Administration for persecuting them. "A trial attorney with the Department of Justice’s Voting Rights Section has resigned, citing concerns about the government’s refusal to prosecute a case involving voter intimidation by the New Black Panther Party. A letter of resignation obtained by The Washington Examiner from a former Justice Department employee makes clear DOJ has refused to allow attorneys in the Voting Rights Section to testify before the congressionally-chartered bipartisan U.S. Commission on Civil Rights, despite subpoenas that could result in their being held in contempt." did not support the lawsuit against them, ab initio." The You Tube of the incident went viral, and most level headed citizens could clearly tell that the intent was one of Voter Intimidation. Why Eric Holder and the Whitehouse have chosen to stonewall this issue and the requests of Congress, is beyond comprehension and any attempts to get to the bottom of why the Department of Justice and the Voting Rights Commission dismissed the case will likely have some Executive Privilege dog and pony rap song to explain away this interference at the polls. In researching this article I discovered that the Black Panthers had many polling places manned by their America hating members. We can and should expect this this coming fall during the General Elections. President Obama should be demanding answers, but I guess this is yet another example of 'social justice'. And some more Hope and Change for us to swallow. What ever it is it reeks, and Holder should be immediately terminated. Favorite War Films - Do You Have A Favorite? No Lei No Lei Oh Lei Lei, Djou Wins in Hawaii!